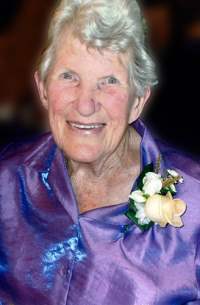 On February 7, 2019, at Montecillo Veterans Home and Hospital, Dunedin, surrounded by her family, aged 88 years. Loved wife of the late Arthur, much loved Mum and mother-in-law of Kevin and Monica, Colin and Kaye, Beverley and Malcolm Ramsay, loved Grandma of Helen and Nick, David and Kelly; Hamish, Grace; Imogen and Tane, and Simeon; loved great-grandma of her 5 great-grandchildren. Requiem Mass will be celebrated in St Patrick’s Bascilica, Macandrew Road, South Dunedin, at 10.00am, on Wednesday February 13, the funeral then leaving for Dunedin Cemetery. In lieu of flowers donations to St John Ambulance would be appreciated and may be left at the Mass. Messages to 16 Kamura Street, Tainui, Dunedin 9013, or leave a message on Maureen’s tribute page above.